Sackville Drive, Middle Sackville (MLS® 201825321): 18 Acres in Middle Sackville. Approx 270 feet wide x 2900 long. 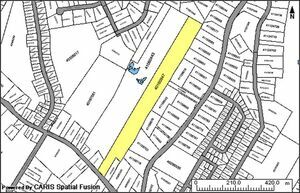 Zoned MU-2 160 Ft Road front on Sackville Drive between Civic 1789 and 1815 Sackville Drive Also access off Rosemary Drive between civic 705 and 667 New Survey in 2017 on file.